"An excellent light side salad to accompany a heavy Persian meal or any meal really. Sumac is the red bitter spice usually served for sprinkling on kebab. It's available at most Middle Eastern stores, but if you can't find it just leave it out. I like to dice the veggies very small about 1/4-inch. Serve with fresh lemon wedges." 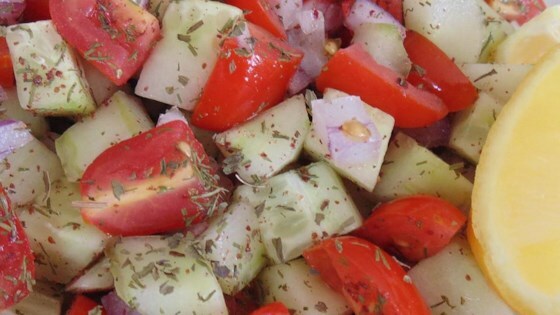 Mix tomatoes, red onion, cucumbers, olive oil, lemon juice, mint, dill, sumac, salt, and pepper together in a bowl. To remove seeds from the tomatoes, slice them in half and squeeze. One half of a red onion was too much. Benefitted from the addition of feta and kalamata olives. Skipped the sumac, added celery salt. Why so many changes? It’s not the real Iranian salad with all the changes. I have lived in Iran and this IS the true delicious recipe. I added a splash of red wine vinegar and a quarter tsp of pressed garlic. I didn’t have the mint and I only had dried dill. It was still awesome. Mmmmm... even my 7 and 11 year old liked it! Made exactly as directed except that I used fresh mint instead of dried, and added some pine nuts that I needed to use up. A great side salad for spring!